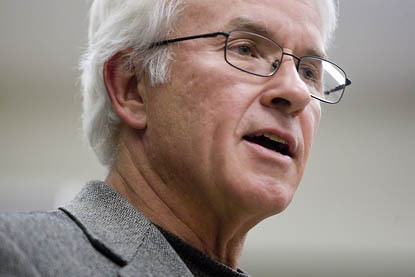 If you think of the yearlong Bates Contemplates Food initiative as an arch built from many stones, Mark Winne ’72 set the moral keystone in place with a lecture on March 30. A sociology major at Bates, Winne served for 25 years as executive director of the Hartford (Conn.) Food System, a nonprofit that developed innovative ways to deliver high-quality and affordable foods to low-income urban families in Connecticut. Now a resident of Santa Fe, N.M., he writes and consults on food system issues and is the author of Closing the Food Gap — Resetting the Table in the Land of Plenty (Beacon Press, 2008). The laid-back Winne (pronounced WIN-ee) shared lessons from his life in food justice in a talk capping a two-day Bates visit sponsored by the Bates Contemplates Food Planning Committee. Winne’s picture of the American food gap wasn’t pretty. The supermarket industry and public transportation policy have left many low-income people in “food deserts” — locations with no ready access to healthy, reasonably priced groceries. The government food-welfare system is biased toward industry interests rather than those of its needy clients, among whom are 32 million food stamp recipients — a record number. And charitable emergency food providers, such as food banks, often just manage the symptom of food insecurity rather than addressing the disease of poverty. And more support for farmers, including funding for farmers markets, CSAs and similar direct-marketing programs. “We’re in danger of running out of farmers,” Winne said. More seriously, Winne explained that as a Bates student from privileged circumstances, it was in Lewiston where he first encountered poverty. Working as a Big Brother, he visited the Lewiston home of his young charge — a visit that left him with an indelible memory of the child’s apartment, its smell of decrepitude and the way it shook from the looms at the nearby Bates Mill. In Lewiston, too, Winne first took on the social justice work that would define his career. He and other Bates students founded a community center to do peer drug and alcohol counseling, then added a breakfast program for children and a food co-op. Forty years later, Winne shared with the Bates audience some precepts distilled from his long experience, a body of experience that spans working a community farm, collaborating with community organizers in Hartford’s poorest neighborhoods and mingling with D.C. power brokers. Winne concluded with a tribute to Bates and its early leadership in food issues, in terms of both on-campus food service and community food system work.